To bring the stakeholders from the performance aftermarket together the first trade show was organized in 1967. The event was held in Los Angeles � it attracted just under 100-manufacturers and approximately 3,000 attendees. In 1977, the SEMA Show moved to Las Vegas which was better equipped to handle the growing requirements of manufacturers and attendees. Today, the show, at the Las Vegas Convention Center (over a million square feet of floor space), boasts over 2,400 exhibitors and more than 170,000 people with ties to the automotive performance aftermarket. Visitors can see the hottest automotive products and attend demonstrations, educational seminars and special events. 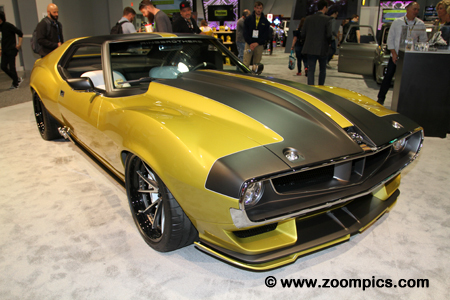 One car attracting a lot of attention at the 2017 SEMA show was this 1972 AMC Javelin AMX. To celebrate their 90th anniversary, Prestone commissioned the Ringbrothers to customize the Javelin. Aside from the obvious modifications, the original motor has been replaced with a Chrysler 6.2-liter supercharged Hellcat V8. This engine produces approximately 1100-horsepower. Hennessey Special Vehicles is in competition with Bugatti to see who can build the quickest production car. 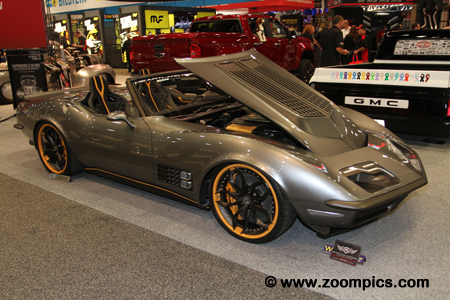 Hennessey used the SEMA show to unveil their latest creation. 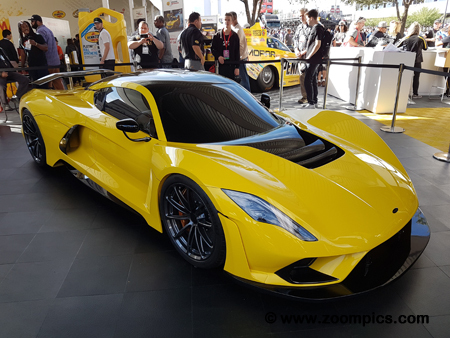 Called the Venom F5 it is designed to reach a speed in excess of 300-mph. To accomplish this, the F5 will be fitted with a twin-turbocharged V8 which is expected to produce 1600-horsepower. The F5 will also have a seven-speed transmission. 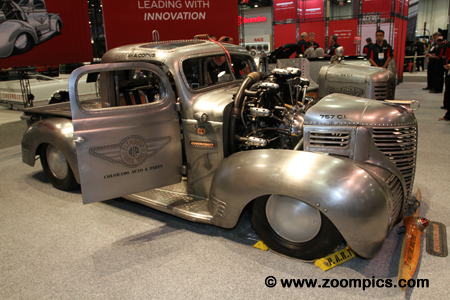 The Covercraft booth featured this wild 1939 Plymouth Pick-up called the Plymouth Air Radial Truck. The Pick-up was created by Colorado Auto and Parts. The old Plymouth is powered by a 1950s seven-cylinder Jacobs engine used in a Cessna. The power comes from the 757-cu.in. radial motor and is transferred to the road by a TH400 automatic transmission. In keeping with the theme, the truck sports an aircraft interior. The Illusion presented by Rick Dore has an aluminum body hand formed by Luc Deley of Marcel�s. Automotive designer and builder, Dore had the body fitted to an Art Morrison and Steve Wilks chassis. His creation is powered by a General Motors LS3 engine. As the car was displayed in the Dynamat booth, it included Dynamat soundproofing. 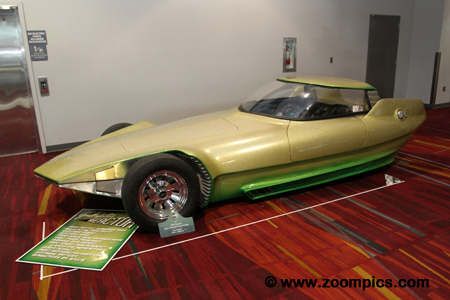 Legendary automotive customizer, Gene Winfield created this aluminum show car in 1964. It was called The Reactor. The car is powered by a flat six-cylinder engine from a Chevrolet Corvair. A self-leveling suspension from a 1956 Citroen DS allows the vehicle to be raised and lowered. The Reactor gained some fame as it appeared in episodes of TV shows such as Bewitched, Star Trek, Batman and Mission Impossible. Kryptonite is the name of this 1955 Chevrolet Bel Air. The car was designed by Pfaff Designs and is owned by Terry Cook. Almost every component on this Bel Air has been modified or changed. It uses an all aluminum 434-cu.in. engine with 18-degree cylinder heads. The motor includes a Hogan sheet metal intake, Holley fuel injection and nitrous by Induction Solutions. The transmission is a TCI 4L80E six-speed. 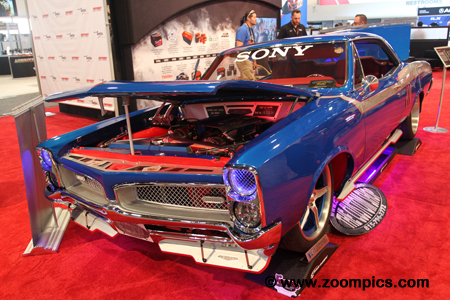 John Wargo of The Custom Shop built the 1967 Pontiac LeMans �GTLS3� which on display at the Odyssey Battery booth. All new sheet metal, custom ground effects, billet spoiler, custom hood, LED headlights and billet one-off wheels are just some of the car�s features. The powertrain includes a Chevrolet LS3 FiTech EFI which produces 550-horsepower, a 4L70E transmission and a narrowed nine-inch rear end. This second generation Prius received an extensive upgrade from American Racing Headers. The car is now called the PriuSRT8 and has been converted to a rear-wheel-drive vehicle. Located under the hood is a 700-horsepower Hellcat engine with a Whipple supercharger. To get the power to the rear wheels the much modified Prius uses a six-speed Tremec manual transmission and nine-inch rear end. And, now for something completely different, a wide-body 1963 AMC Rambler called the Flare Witch Project. Part of this build includes the addition of a front subframe from a first-generation Chevrolet Camaro and in the rear a fifth-generation Camaro subframe. In keeping with the General Motors theme, the six-cylinder flathead Rambler engine has been replaced with a 5.3-liter V8. This car will be used for track days. When Mattel launched their Hot Wheels brand in 1968 the first model car they created was the Chevrolet Camaro. To celebrate this partnership, Chevrolet is producing a 2018 Camaro Hot Wheels 50th Anniversary Edition. The car will be available as a coupe or convertible but does not include any performance enhancements. 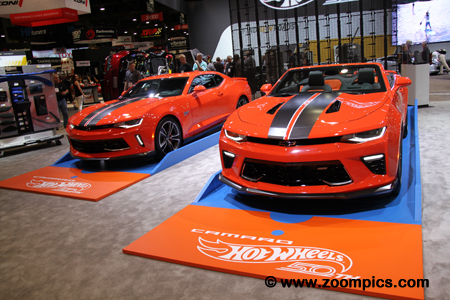 The orange paint used on these Camaros is called �Crush�. 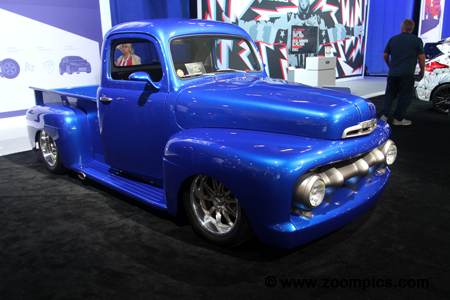 This 1958 Chevrolet Apache was designed by Ralph Holguin and built by RMD Garage. Called the Dream Catcher this truck was featured on the Velocity channel. 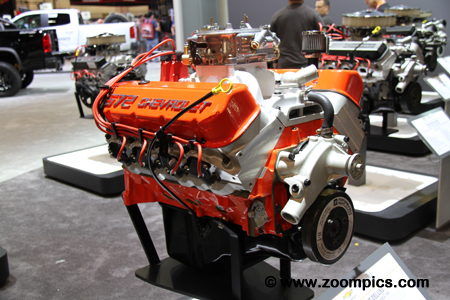 The powertrain is a General Motors LS3 engine mated to a six-speed transmission. The TCI spec one chassis has a Ride Tech four-link coil-over suspension with Curry rear end and fourteen-inch Wilwood brakes. The body has also received many modifications. 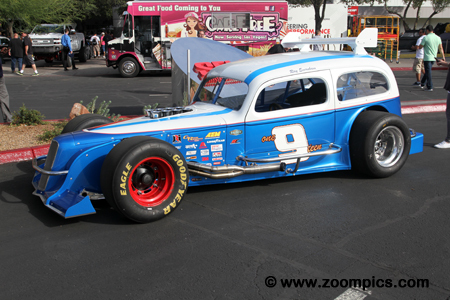 Car collector auction company, Barrett-Jackson had a couple of vehicles on display. One of them was this 1972 Chevrolet C10 Custom Pickup. 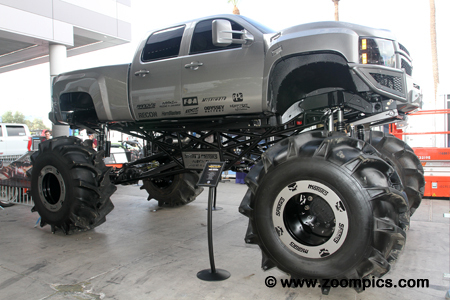 Most of this truck�s modifications are to its appearance. The C10 has a chopped roof, leaned-forward rear wheel wells, one-piece hood and cowl and a custom windshield. Under the truck is a 700R4 transmission and twelve-bolt rear end. It is powered by a small block Chevy. Four Toyota NASCAR drivers � Denny Hamlin, Martin Truex, Jr., Kyle Busch and Daniel Suarez - were given the task of customizing Toyota Camrys. The example below was modified by Hamlin. Some of the features include � a wide-body kit with three-inch fender flares, 20 X 10 American Racing wheels, Michelin Pilot Sport Cup 2 tires, StopTech Big Brake kit, Recaro racing seats, Schroth four-point harness and a JBL sound system. Arizona performance experts ScienceofSpeed specialize in the Honda S2000 and Acura NSX. 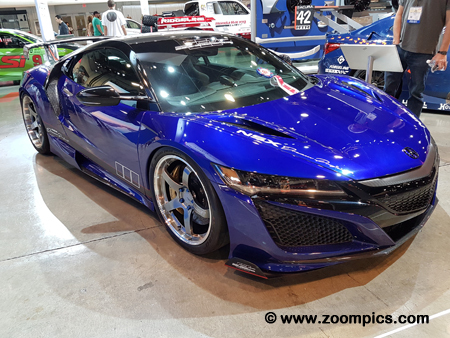 In partnership with Honda, they brought this upgraded NSX to the 2017 SEMA show. Working their magic, ScienceofSpeed boosted the horsepower by another thirty-seven and increased the torque by thirty-one lb.ft. The company also reduced the weight of the car and improved its handling and aerodynamics. Kia had two customized Stingers on display. These turbocharged, rear-wheel cars were modified by West Coast Customs. 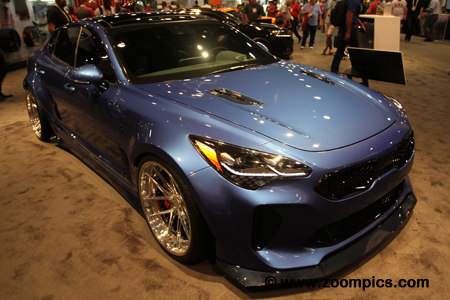 The vehicle pictured is called the Stinger GT Wide Body. The car is an inch lower than the stock Stinger and uses twenty-one-inch Keen wheels. The 3.3-liter V6 engine has been upgraded with a K&N air intake and Borla exhaust system to produce approximately 380-horsepower. This Lexus LC500 coupe is part of the company�s new Inspiration Series. The customized model on display is inspired by the new Marvel Studios movie, Black Panther. 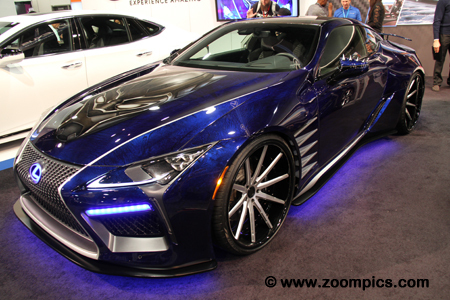 This LC500 is fitted with a wide-body kit, twenty-one-inch forged aluminum wheels and a custom paint job which includes an air-brushed image of the Black Panther�s mask on the hood. Front and center at the Ford display was this Ford GT. This particular model is the �67 Heritage Edition which was created to honour the Ford GT40 Mark IV that won the 1967 Le Mans 24-Hour race. It has a limited number of upgrades the first of which is the graphics followed by red brake calipers, unique trim used on the interior and the silver rear view mirrors. 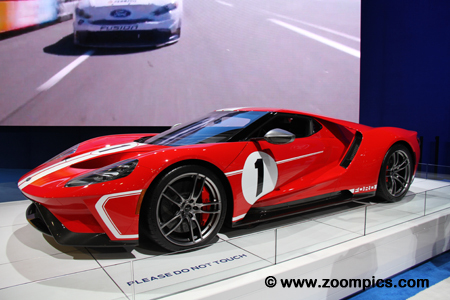 The inspiration for the Ford GT pictured above was also on display in the Ford compound. 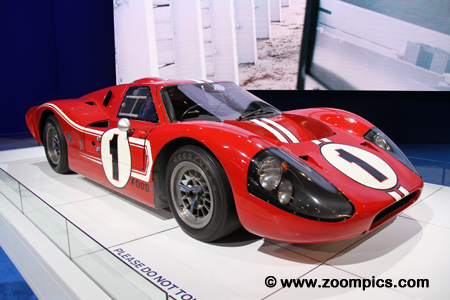 The winning car at the 1967 Le Mans 24-Hour race was shared by Dan Gurney and A.J. Foyt. This was considered an all American victory as the drivers (Foyt and Gurney), engine (Ford), chassis (Kar Kraft), tires (Goodyear) and team (Shelby-American) were all from the United States. 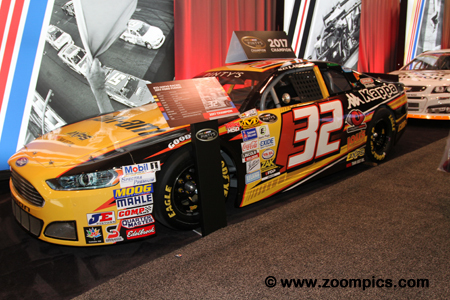 This is the Ford Fusion that Alex Labbe used to win the Canadian NASCAR Pinty�s championship. On the way to his first NASCAR title, Labbe scored wins at Delaware Speedway, Wyant Group Raceway, Edmonton International Raceway, Riverside International Raceway and Autodrome St-Eustache. Labbe�s first finish out of the top-five was a sixth place at the second CTMP event, but it was after he started last. There were a number of Pirelli World Challenge cars on display. 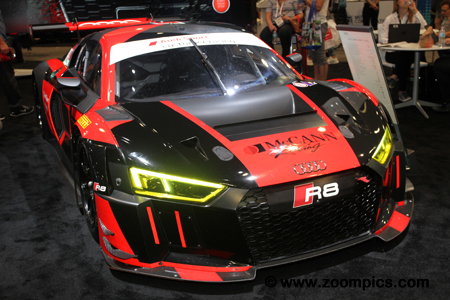 This is Michael McCann�s 2017 Audi R8 LMS GT3 that he shared in the SprintX class with Mike Skeen. Their best result was a fourth in the season finale at Circuit of the Americas. Prepared to FIA GT3 specifications this car is powered by a 5.2-liter 90-degree V10 engine. The DOHC motor has four-valves per cylinder and is managed by a Bosch Motronic system. 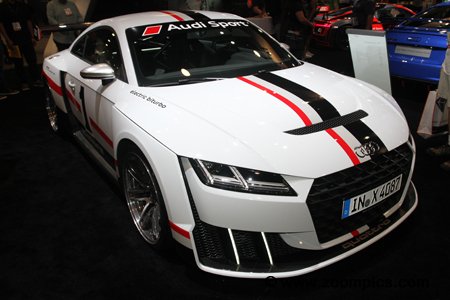 Also appearing in the Audi compound was this 2018 Audi TT Clubsport Turbo. The car is fitted with a 2.5-liter five-cylinder engine which uses an electrically-assisted turbocharger to produce 600-horsepower. The Audi also features an all-wheel-drive-line with twenty-inch wheels. The body kit also includes a fully-adjustable carbon-fiber spoiler. The BMW M1 was designed by Giorgetto Giugiaro and powered by in-line six-cylinder DOHC twenty-four valve engine which produced approximately 490-horsepower. These cars were originally used in ProCar Series which ran as a support event to European rounds of the Formula 1 championship. 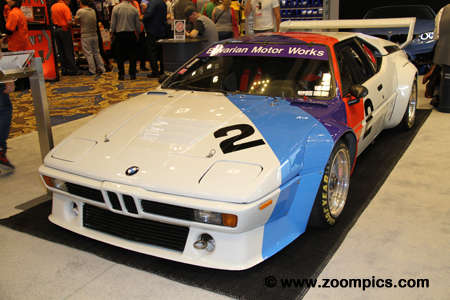 The BMW pictured competed in the IMSA series at Mosport and the 24 Hours of Daytona in 1981. A couple of years ago General Motors re-introduced the COPO (Central Office Product Order) Camaros. These hand-built cars � sixty-nine in all � are not street legal. They are intended for NHRA drag racing. These unique Camaros are available with a number of different engine options and a three-speed automatic transmission. This particular model is the Hot Wheel s 50th Anniversary Edition Concept Vehicle. In 2018, Acura, in conjunction with Honda Performance Development and Honda Racing Development is offering for sale their race proven Acura NSX GT3. Introduced in 2017, the GT3 NSX competed successfully in the Pirelli World Challenge and WeatherTech SportsCar series. The price tag of approximately $550,000 includes customer support. Parts, training and engineering services are also available. For the first time in the United States, Honda Performance Development is selling Honda Type R�s K20C1 as a crate engine. The 2.0-liter turbocharged four-cylinder produces 306-horsepower. The price tag for this motor is $6519.87 which comes with a couple of eligibility requirements. The engine can only be installed in Honda or Acura vehicles and the owner must be competing in sanctioned motorsport events. Built for the Pikes Peak International Hill Climb, this Acura NSX recorded the seventh fastest run and finished third in the Time Attack 1 class at the 2017 event. The Acura is equipped with 3.5-liter DOHC V6 engine. But what makes the car truly unique is the production-based Super Handling All-Wheel Drive and the nine-speed DCT transmission. Acura is returning to the IMSA WeatherTech SportsCar Championship with two of these Acura ARX-05s. The ARX-05 will compete in the Daytona Prototype international class and will be prepared by Team Penske. 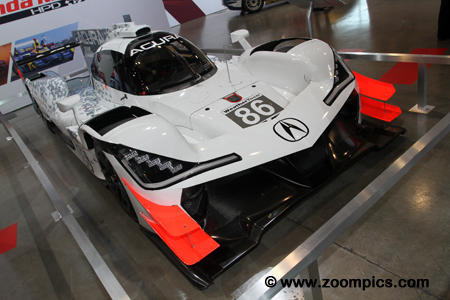 The chassis is constructed by ORECA and fitted with Acura bodywork. The production-based Acura AR35TT twin-turbocharged 3.5-liter V6 engine will be used to power the ARX-05. 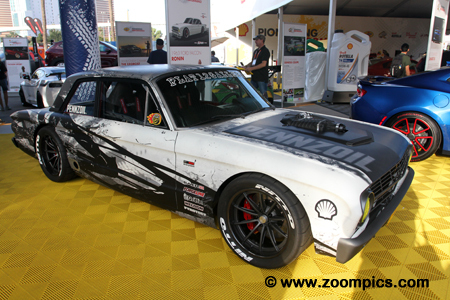 Plenty of exciting cars were parked on the Toyo Tire �TREADPASS�. 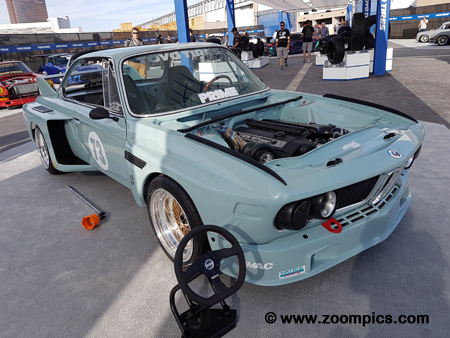 This BMW was inspired by the early �70s lightweight BMW 3.0CSL coupes. Owner, Willy Izaguirre used a 1973 BMW 3.0CS coupe as the starting point for this project. After much body work, the drivetrain was replaced an S52 engine and a ZF six-speed transmission from a 1998 BMW M3. Equipped with a Precision turbocharger this motor is rated at 550-horsepower. This is the popular Milodon 7-liter/426-cu.in. Hemi engine. 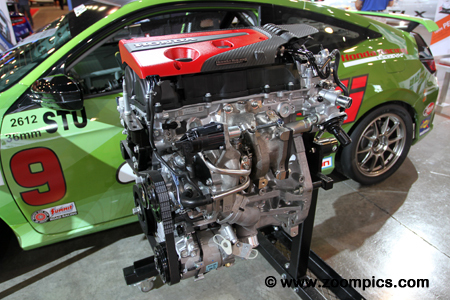 This Hemi was widely regarded as the strongest most reliable motor for drag racing in the �80s. It was also used for drag boat racing and tractor pulls. In addition to producing the aluminum engine block, Milodon also manufactured Stage II cylinder heads, magnesium valve covers, gear drives, oil pans and oiling systems. 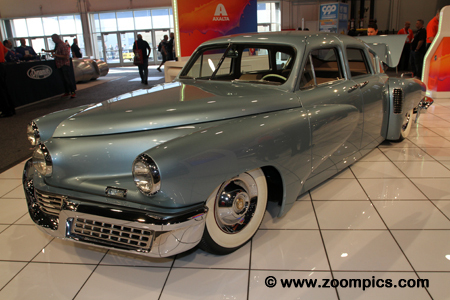 It looks like a Tucker 48 conceived by Preston Tucker but in fact is a replica. 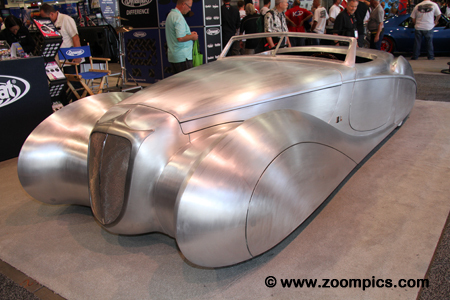 One of the cars featured in the Axalta booth, this vehicle was constructed by Rod Ida Concepts. The car was built by hand and uses a 4.6-liter turbocharged V8 Cadillac Northstar engine. The motor is mounted longitudinally in the rear of the vehicle � keeping it true to the powertrain layout used in the original Tuckers. 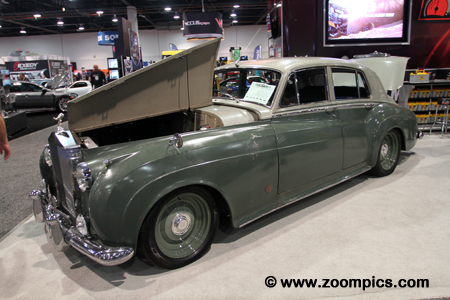 This Rolls-Royce Silver Cloud was located in the Optima Battery booth. A 1958 model it is called the Derelict - the car was modified by ICON and is described as a modern ride with a vintage vibe. The chassis has been enhanced by Art Morrison. Stopping the Rolls is a hydro-boosted ICON sport brake package by Brembo. The final feature is a fuel injected Chevrolet LS7 with a 4L85E automatic transmission. This is a 1952 Cunningham C-3 Vignale. Twenty-five C-3s were constructed by Briggs Cunningham so that the car would meet the homologation requirements for the Le Mans 24-Hour race. The chassis was built in Florida and the Cunningham was equipped with 331-cu.in. Chrysler engine. This particular car, #5207 was discovered ten years ago in the basement of a Greenville, South Carolina home. This NASCAR Modified is the creation of former NASCAR crew chief, Ray Evernham. Called the Ghost this car uses a combination of old and new technology from road and oval racing disciplines. The body is a 1936 Chevrolet sedan which is mounted on a rectangular and round steel chassis. The engine is a 410-cu.in. aluminum Chevrolet SB-2 from Pro Motor Engineering. 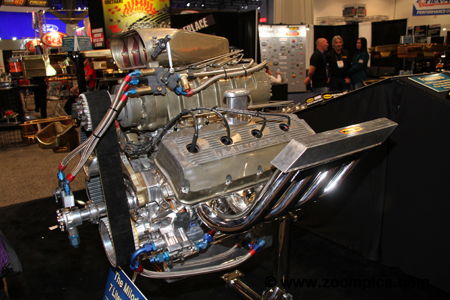 With Kinser fuel injection the car should produce 850-horsepower. The 20th anniversary of the Petit Le Mans was won by the No. 2 Nissan Dpi. 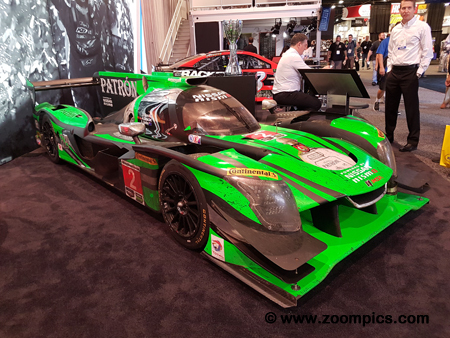 With sponsorship from Tequila Patron drivers � Ryan Dalziel, Scott Sharp and Brenden Hartley took the victory when their teammate, Pipo Derani was penalized for avoidable contact. The car which competes in the WeatherTech SportsCar Series is powered by a 3.8-liter Nissan VR38DETT engine. Ford brought several concept cars modified by different custom shops to the 2017 SEMA show. This is a Roush 729 Mustang. This wide-body Mustang takes its styling cues from the 1970 Boss 429 and is finished in Ford�s �Grabber Green�. The 5.0-liter Ti-VCT V8 engine includes Roush�s new supercharger which results in a motor that produces 729-horsepower. The car also uses a 10-speed automatic transmission. This is an E36 BMW 3 Series which has received extensive modifications � the most obvious is a wide-body kit. The E36 line was produced from 1990 to 2000 as a number of different models and powertrain combinations. At the top of the list was the M3 which used the S50 or S52 inline six-cylinder engine. This BMW is now equipped with a more powerful Nissan RB26 motor used in the Nissan Skyline GT-R. The Chevrolet Corvair � Ralph Nader�s �Unsafe at any Speed� car. In his evaluation of the Corvair, Nader identified several safety concerns - the swing-axle suspension, lack of a front sway bar and the difference in front and rear tire pressure recommendations, etc. This Corvair was on display in the �House of Color� booth. 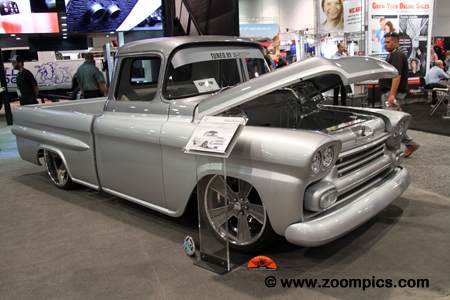 It�s was built as a lowrider and showcases the company�s paint line. Heartland Customs built this 1972 C3 Chevrolet Corvette which is called the Menace. Heartland specializes in classic cars and trucks from the 1930s to 1970s. This custom manufacturing company upgrades these classics with modern technology. The Menace uses a SPECVETTE chassis, fuel injected 850-horsepower aluminum 427-cu.in. engine and a six-speed manual transmission. J-Rod & Custom of Black Diamond, Washington is responsible for this 1963 Lincoln Continental. The exterior and interior of the Continental were completely redone. The original motor was removed and replaced with a Ford Motorsports 427-cu.in. V8 which produces 535-horsepower. Also included is a custom fabricated four-link rear suspension, Ride Tech coil-overs, a Ford nine-inch rear end and Baer brakes. 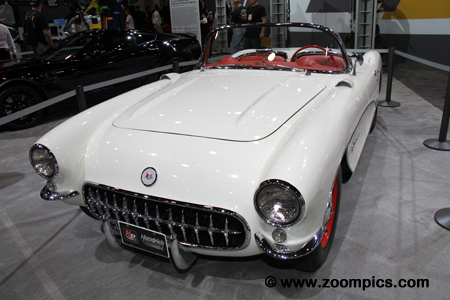 Appearing in the General Motors area was this 1957 Chevrolet Corvette. The 1957 Corvette included many new features and options that were not available on previous models. For the first time, Corvettes were equipped with a four-speed transmission and the engine displacement was increased to 283-cu.in. Mechanical fuel-injection and a heavy-duty suspension with big brakes were offered as options. 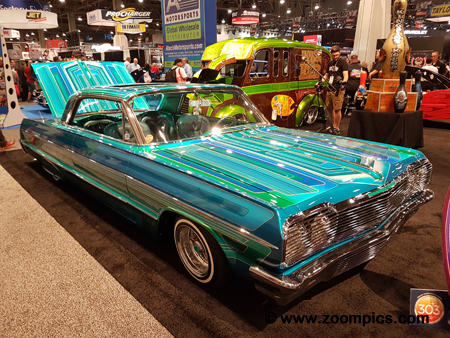 Another car appearing in the �House of Color� booth was this 1964 Chevrolet Impala. Called the �Legacy�, the Impala was built and painted by its owner, Albert DeAlba, Jr. The body has undergone extensive modifications � shaved door handles, emblems & trunk lock, frenched antennas, molded front fenders and a custom one-piece grill. And, like every lowrider-inspired creation it is equipped with hydraulics from Homies. 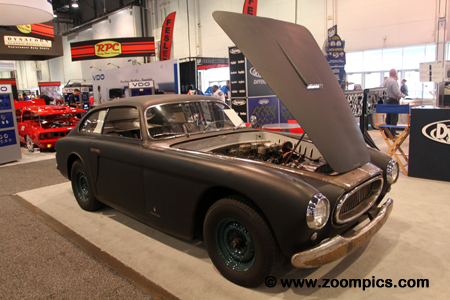 The Shell/Pennzoil area was in front of the Las Vegas Convention Center and hosted several unique vehicles � one of them was this 1963 Ford Falcon. The car built by Jeff Allen is called Ronin. 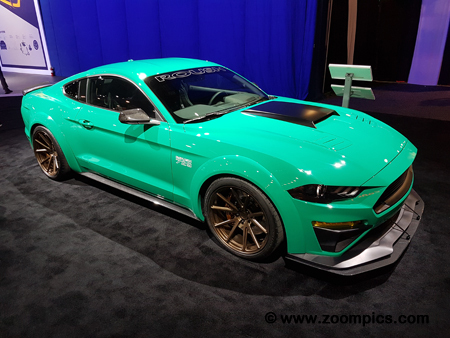 Some of the key features of this car include a Roush Performance Coyote supercharged engine, a Pyrotect fuel cell, a Baer Extreme fourteen-inch brake system, Forgeline GT3C wheels and Nitto tires. Premier Street Rods of Lake Havasu City, Arizona are responsible for the extensive upgrades on this 1951 Ford F1 pickup. The truck is now equipped with modern features such as push-button start, leather and suede interior, air conditioning, LED lighting and an air-ride suspension. The powertrain includes a Ford 347-cu.in. stroker and an automatic overdrive transmission. 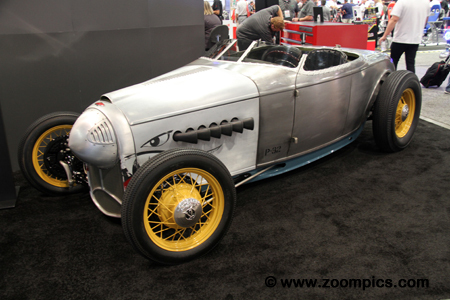 One of the many Chip Foose creations at the 2017 SEMA show was this 1932 Ford Roadster. The Roadster served as the basis for a car called the P32 �Street Fighter�. The aero-themed vehicle was inspired by the WWII P52 Mustang military aircraft. The details include a polished aluminum body, bullet nose grill, exposed exhaust pipes, bomber seats, exposed rivets and a Zephyr center gauge cluster. The organizers of the Goodguys Rod & Custom Shows had limited entry to their events to 1972 and earlier muscle cars. However, Goodguys identified an opportunity and raised the year cut-off to 1987. To celebrate this change, they commissioned Goolsby Customs to modify a 1979 Ford Mustang. They made many changes including lowering the Mustang and swapping the 2.3-liter motor for a 5.0-liter Ford crate engine. The General Motors area had several of their crate motors on display. 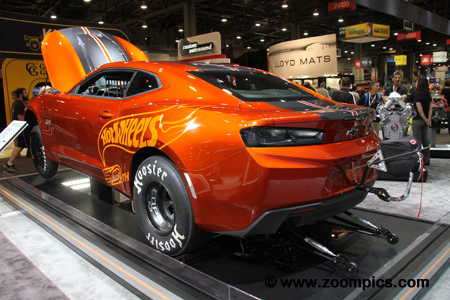 This is the ZZ572/720R Deluxe which is built for drag racers that compete in the nine-second range. The 572-cu.in. big block V8 produces 727-horsepower at 6,300-rpm and 680-lb.ft. of torque at 4,900-rpm. The engine package includes a 1090-cfm carburetor but not the starter and fuel pump. This 1971 Ford F-100 was converted for off-road competition. 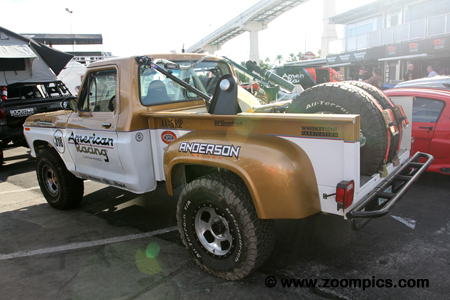 It appeared in the American Racing Custom Wheels area with other off-road vehicles. The truck was built by Spiess Mechanical and Fabrication. In addition to providing construction equipment repair and maintenance, Spiess also provides fabrication and welding services. Farmbird is based on an old Pontiac Firebird and is the result of the combined efforts of cast members from Discovery Channel�s Street Outlaws. Despite its appearance, it is equipped with some of the best performance parts in the automotive aftermarket. The Farmbird uses Wilwood and Hawk brakes, Nitrous Express two-stage nitrous kit, MSD ignition system, T-10 four-speed transmission and the list goes on. It appears that this 2008 Chevrolet Silverado 2500 got the �works�. 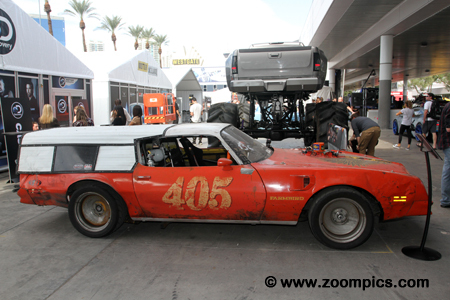 This Chevrolet was modified by the Discovery Channel�s Diesel Brothers. Appropriately called, Hercules this 2500 is fitted with sixty-four-inch tall tires and twenty-inch FOA shock absorbers. The Overkill chassis also includes Axel Tech 4000s and a twenty-three-inch drop SCS transfer case. To complete the project the truck has Ruff Stuff Specialties Components.